This lease agreement is designed for a transaction in which the landlord leases a parking structure to an operator, and receives minimum and percentage rent from the operator tenant. THIS PARKING LEASE (“Lease”) is executed by and between _______________ (“Landlord”) whose address is _____________, and _________________ (“Tenant”) whose address is ______________, and pertains a certain parking facility located in ____________ (“premises” or “leased premises”). The premises are more particularly described in Exhibit “A” attached hereto and incorporated herein by reference. 1. Demise. Landlord hereby leases to Tenant, and Tenant hires from Landlord the premises on the terms and conditions specified herein. 2. Term. The term of this Lease shall commence on ____________, (“Commencement Date”) and shall expire five (5) years thereafter, on _____________. Notwithstanding the foregoing, Landlord may elect to terminate this Lease for any or no reason upon sixty (60) days written notice to Tenant of Landlord's intention to so terminate. 3. Late Delivery. 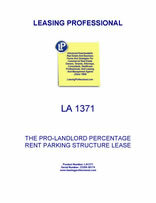 If Landlord, for any reason whatsoever, cannot deliver possession of the leased premises to Tenant at the commencement of the lease term, this Lease shall not be void or voidable, nor shall Landlord be liable for any loss or damage resulting therefrom, but in that event, there shall be no accrual of rent for the period between the commencement of the lease term and the time which Landlord can deliver possession. 4. Minimum Rent. Tenant shall pay to Landlord at such place as Landlord is designated to receive notice herein, or at such other place as Landlord may otherwise designate, without deduction, offset, prior notice, demand, or counterclaim whatsoever, as minimum rent for the premises the sum of ________ ($_____) per month. Such rental payments shall be in lawful money of the United States, payable in advance on the first day of each month during the term. If the Lease commences on other than the first day of a calendar month, the first month’s rent shall be prorated accordingly. (a) In addition to the minimum rental specified herein, Tenant will pay to Landlord at the times and in the manner specified herein as additional rental a percentage of Tenant’s gross sales equal to (i) fifty percent (50%) of gross sales from $_______ to $________ per year, plus (ii) seventy percent (70%) of gross sales from $_________ to $_______ per year, plus (iii) eighty percent (80%) of gross sales greater than $__________ per year. For purposes of the quarterly payments specified below, the foregoing annual figures or “breakpoints” shall be divided by four (4) when computing the percentage rent due for any particular quarter. (b) The term “gross sales” as used herein shall include the entire gross cash receipts of every kind and nature from sales and services made in, upon or from the leased premises, and every department operating within the leased premises, whether operated by Tenant, or by a subtenant or subtenants, or by a concessionaire or concessionaires, excepting therefrom any rebates and/or refunds to customers, and the amount of all sales tax or similar tax receipts which have to be accounted for by Tenant to any government or governmental agency. Tenant shall use its best efforts to collect all credit sales as soon as possible after such sales are made. (c) Within twenty (20) days after the end of each calendar quarter of the term hereof, commencing with the twentieth (20th) day following the end of the first calendar quarter of the term hereof and ending with the twentieth (20th) day of the month next succeeding the last month of the leased term, Tenant shall furnish to Landlord a statement in writing, certified by Tenant to be correct, showing the total gross sales made in, from or upon the leased premises during the preceding calendar quarter, and shall accompany each statement with a payment to Landlord equal to the percentage rental due, utilizing one-fourth of the annual breakpoints as specified above for such calendar quarter. (d) The Tenant shall keep full, complete and proper Looks, records and accounts of its daily gross sales, both for cash and on credit, for the leased premises. The Landlord and Landlord’s agents and employees shall have the right at any and all times, during regular business hours, to examine and inspect all of the books and records of the Tenant pertaining to the business of the Tenant conducted in, from or upon the leased premises which Tenant shall produce by demand by Landlord or his agents from the purpose of investigating and verifying the accuracy of any statement of gross sales. Tenant shall submit to Landlord copies of all sales tax reports prepared for any governmental authority, within five (5) days of their due date. Tenant shall further submit to Landlord copies of any audit performed by a certified public accountant (CPA) upon Tenant’s books and records, within five (5) days following the date that such audit is completed by such CPA. The Landlord may once in any lease year cause an audit of the gross sales of Tenant to be made by an independent certified public accountant of Landlord’s selection, and if the statements of gross sales previously made to Landlord by Tenant shall be found to understate Tenant’s gross sales by two percent (2%) or more than the amount of Tenant’s gross sales shown by such audit, Tenant shall immediately pay to Landlord the cost of such audit, as well as the additional rental shown to be payable by Tenant to Landlord; otherwise, the cost of such items shall be paid by Landlord. (e) The acceptance by Landlord of any moneys paid to Landlord by Tenant as additional rental for the leased premises as shown by any yearly statement furnished by Tenant shall not be an admission of the accuracy of the yearly statement or of any of the quarterly statements furnished by Tenant during the year reported therein, or of the sufficiency of the amount of such additional rental payment, but Landlord shall be entitled at any time within four (4) years after the receipt of any such additional rental payment to question the sufficiency of the amount thereof and/or the accuracy of the statement or statements furnished by Tenant to justify such amount. Tenant shall, for such period of four (4) years after submission to Landlord of any such statement, keep safe and intact all of Tenant's records, books, parking ticket stubs, accounts and other data which in any way relate to or are required to establish in detail Tenant’s gross sales and any authorized deductions therefrom as shown by any such statement, and shall upon request make the same available to Landlord, Landlord’s auditor, representative, or agent for examination at any time during such four (4) year period. (f) Tenant shall continuously during the entire term, conduct and carry on Tenant’s business in the leased premises, and shall keep the premises open during the business hours and cause Tenant’s business to be conducted therein during the business hours of each and every business day as specified by Landlord from time to time for the premises; provided, however, that this provision shall not apply if Tenant’s business shall be temporarily shut down on account of strikes, lockouts or causes beyond the control of Tenant. Tenant shall keep the leased premises adequately operated with sufficient personnel to care for the patronage and conduct of such business in accordance with good business practices. In the event Tenant does not so operate its business as specified herein, then Tenant shall pay Landlord, as additional rent, one-thirtieth (1/30th) of the monthly minimum rental for each day Tenant does not so operate. Such payment shall be in addition to the monthly minimum rental herein provided and shall compensate Landlord for the loss of percentage rental caused by Tenant’s failure to so operate. (g) It is understood and agreed that nothing contained in this Lease or in any act of the parties hereto shall be deemed to create any relationship between the parties hereto other than the relationship of Landlord and Tenant. 5. Advance Rent. An amount equal to the first month’s minimum rental shall be paid herewith to the Landlord upon execution of this Lease as advance rent, receipt of which is hereby acknowledged, which shall be applied to the rent first coming due under the Lease. 6. Accord and Satisfaction. No payment by Tenant or receipt by Landlord of a lesser amount of monthly rent or any other sum due hereunder, shall be deemed to be other than on account of the earliest due rent or payment, nor shall any endorsement or statement on any check or any letter accompanying any such check or payment be deemed an accord and satisfaction, and Landlord may accept such check or payment or pursue any other remedy available in this Lease, at law or in equity. 7. Existing Improvements. Tenant and Landlord agree and acknowledge that all improvements and structures existing upon the premises as of the execution hereof belong to Landlord, including without limitation, all booths, traffic control gates (whether mechanical or otherwise) and ticket machines, except that Tenant owns the time clocks installed by the Tenant upon the premises.